This is my 500 word story on World Water Day 2019 themed 'Water for All, Leaving No One behind' as an entry for the 5th Writing Project (2nd Writing Project on Water Day) organized and coordinated by Chinthaka Nanayakkara - who was a former Brand Ambassador to Sweek.com but now active in Wattpad! It was nice of him to invite me personally to join this Writing Project on World Water Day 2019 and I was very happy to accept. Using Google Drive he shared a word document with me and when I wrote my 500 draft story he edited and enhanced it. When the story was ready to be published, Chinthaka designed me a book cover using Canva.com. I sincerely hope he would feature my story in his new promo video on World Water Day 2019 and provide his guidance to expand this 500 words story into a 10K e-book to be published in Amazon! This is my 500-word story on World Water Day 2019 themed 'Water for All, Leaving No One behind' as an entry for the 5th Writing Project (2nd Writing Project on Water Day) organized and coordinated by Chinthaka Nanayakkara - who was a former Brand Ambassador to Sweek.com but now active in Wattpad! In Rome, on 19th April 2018, Food and Agriculture Organization (FAO) of the United Nations designated Sri Lanka's ancient yet still functional irrigation mechanism known as Ellanga System (to be more analytical and technical; Cascaded Tank-Village System) as a Globally Important Agricultural Heritage System (GIAHS). FAO Deputy Director-General, Ms Maria Helena Semedo, granted the prestigious GIAHS Award to the Secretary to Sri Lanka's Ministry of Agriculture, Mr B. Wijayaratne, at the International Forum and Award Ceremony for new GIAHS Sites held at the FAO headquarters in Italy, Rome. The GIAHS Award for Ellanga System / Cascaded Tank-Village System was bestowed upon Sri Lanka by FAO in response to a proposal submitted by Sri Lanka's Ministry of Agriculture which requested FAO to incorporate the Ellanga System / Cascaded Tank-Village System of Palugaswewa (Anuradhapura District) in the FAO list of GIAHS. Palugaswewa consists of 12 Cascaded Tank-Village Systems within the Malwathu and Yan Oya river basins. 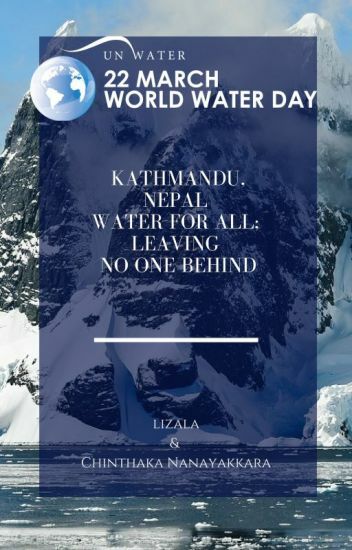 This is my 300 word story on World Water Day 2019 themed 'Water for All, Leaving No One behind' as an entry for the 5th Writing Project (2nd Writing Project on Water Day) organized and coordinated by Chinthaka Nanayakkara - who was a former Brand Ambassador to Sweek.com but now active in Wattpad! It was nice of him to invite me personally to join this Writing Project on World Water Day 2019 and I was very happy to accept. Using Google Drive he shared a word document with me and when I wrote my 300 draft story he edited and enhanced it. When the story was ready to be published, Chinthaka designed me a book cover using Canva.com. me a book cover using Canva.com. provide his guidance to expand this 500 words story into a 10K e-book to be published in Amazon! This story is written by Chinthaka Nanayakkara & Ganga Agnihotri. Dedicated to all the innocents who sadly perished during the tragic events of Holocaust and for their forever-grieving families as well as the few lucky survivors who lived to tell the world what really happened. The main character of this story name Elaine Max Fernandez Rivera. She is a daughter of one of the most powerful business tycoon. Somehow everything change when her parents died. In her lonely world, she meet Dyren Ash Anderson. The backup lawyer of Tristan, her lawyer for ages and a good friend of hers. For years her concern is to take revenge to his brother and friends, who treat her like crap. That time all she wants is their company, to mourn with her. However they all left her without any explanation. She was hopeless, felt nothing in her heart. It became empty the day they neglected her. It change her mind and heart when Dyren came to her life. Strange feeling crept into her, mix emotions that she never felt long time ago. But happiness die suddenly when Elaine find out that Mr. Anderson is falling in love with someone else and that could not be her. She kept away from him, she can't bear the pain she felt. Fate leads me to you. And fate had broken us two. But without fate I'm no puppet nor are you. And fate wouldn't have been able to tie our strings together. But I would never change a bit. "Chinthaka Nanayakkara's unique writing project on World Water Day (WRIPE-5) is successfully underway. We have noted that fourteen mini e-books have been published online so far under his guidance by aspiring writers from USA, Spain, Albania, Kenya, India, Nepal and Sri Lanka. We would like to add Germany to the list. This is our own mini e-book on song of water for the upcoming world water day 2019! May everyone hear this across the cyberspace!" This is my 500 word story on World Water Day 2019 themed 'Water for All, Leaving No One behind' as an entry for the 5th Writing Project (2nd Writing Project on Water Day) organized and coordinated by Chinthaka Nanayakkara - who was a former Brand Ambassador to Sweek . com but now active in Wattpad!